WrestleMania is coming to New Jersey on April 7th. The promotional material might say New York, but the show of shows is taking place across the river. 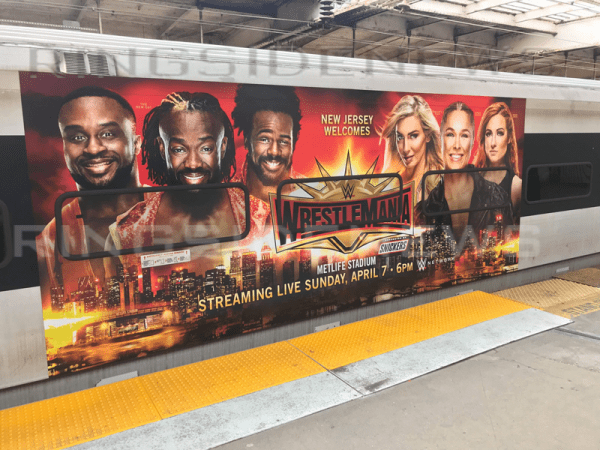 There is no shortage of excitement and people of New Jersey woke up this morning with a very different look to their train for the morning commute. You can see The New Day are featured heavily as well as the women in the RAW Women’s Title match. It is pretty safe to say that WrestleMania will put a big spotlight on all six of those people. As time goes on and we get closer to the event it is totally expected that we will see even more signage and promotion pop up around the city. By the time Mania rolls around both NJ and NY will look like WWE World if they have anything to say about it.